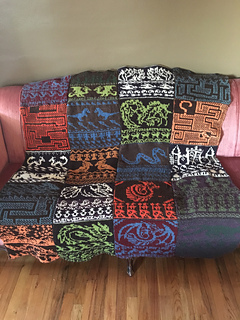 Sizeable - original 50" x 50"
Yarn Quest 2017 - The Grand Quest Blanket MKAL is included in the Yarnia - The Grand Quest Compilation eBook. For those of you just wanting the core scarf quests (Heroes, Campaign 2, Campaign 3) there will be an eBook released for just those with the release of the second Core Campaign MKAL. This is not considered to be a part of the core storyline of the Yarn Quest MKAL’s and instead a separate story from the main quests. You will be rolling a completely new character for this campaign. Instructions and character sheet will be included. 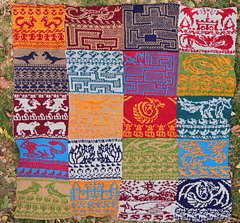 This adventurous double knitting pattern is designed as a series double knit squares that are seamed together to create a fantastical blanket! This quest will play out in a 20 week campaign following your character’s adventures through the land of Yarnia. 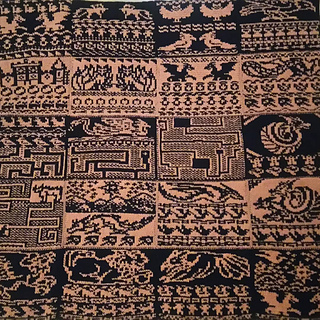 In addition to the document outlining the basics of the MKAL you fill find Character Sheets for both you and a Feline Companion, instructions for filling in your sheets, and the basic cast on instructions. 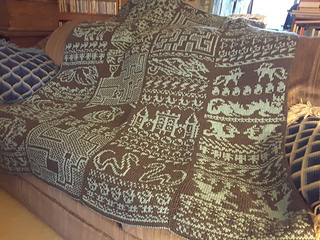 Pattern will use 4000 yards of worsted weight total. 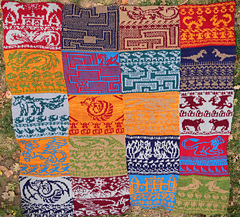 Blanket will be knit in 20 blocks of 100 yards of each color (200 yards total), so yarn colors can be mix and matched over time making this blanket a fantastic stashbuster. 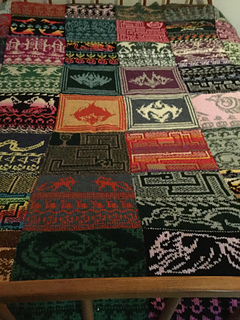 There will be additional instructions at the end of the MKAL to make the blanket larger if desired. 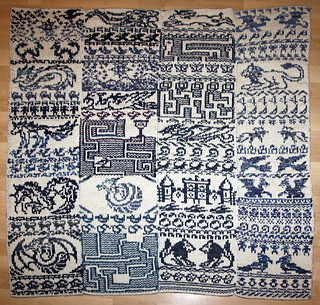 You will need additional yarn to seam blanket together at the end of the project. Clues will be released once every 2 weeks and include both story and any new charts. US 5 (3.75 mm) needles or size needed to achieve gauge. Make sure your gauge is not larger than the stated gauge or you may run into issues with yarn amounts. Clues will be released every other Friday starting March 3rd and running through November 24th. If you don’t have a set already, I highly recommend getting a set of 7 D20 gaming dice (D4, D6, D8, D10, D12, D20). They can be found at your local game store (Games by James, etc) or through Amazon - Make sure you pick a set like this one~ (with the 7 different dice, pick whatever colors you like best!). If you don’t want to pick up a set of dice, sites like Random.org or random number generators will also work. There’s probably an app out there for dice rolls, because there’s usually apps for everything. This is an intermediate level project, previous experience with chart reading is recommended. 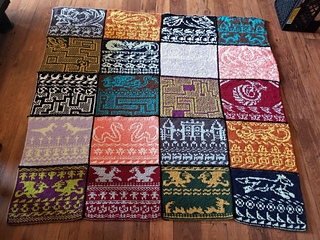 Additional instructions for extra squares will be included at the end fo the MKAL.